I am here to relax. The phrase became my mantra as I was driving white-knuckled around the hairpin turns along scenic Highway 1 in early November. Repeating the words in my head was an attempt to ignore my fear of heights being tested as the narrow road ended just to my left with a stomach-churning drop down the craggy cliffs and into the ocean. CAMPTASTIC: While it may not be as secluded as other campgrounds, Ventana still gives you enough space to take in the forest’s scenic beauty. Still, the views were stunning and after the winding drive we pulled into our final destination, the Ventana Campground in Big Sur. It was my first vacation in a long time, and my first time going to Big Sur, but the area had always fascinated me, particularly its relationship to writers. It was the place that romanced writers like Jack Kerouac, Henry Miller, and Hunter S. Thomson. In middle school, Thompson in particular fueled my curiosity about Big Sur. In letters to friends and family he described trips to its forests, where he hunted wild boar with large-caliber handguns. All these years later my own plans for Big Sur were far more prosaic, opting for a few days of light camping, reading, and general laziness amid the natural beauty of a forest perched on the coast. 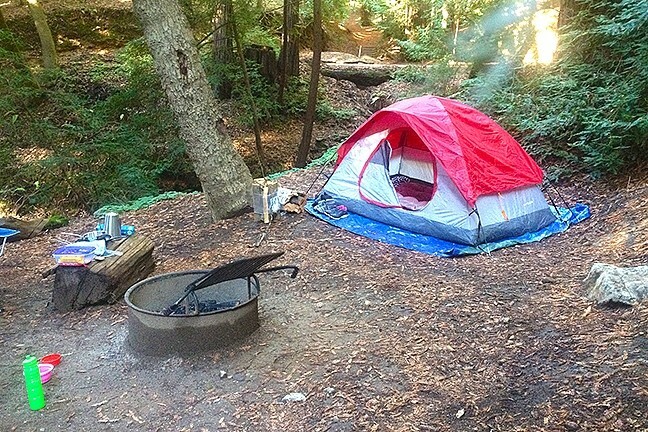 Situated just off the highway in a stunning grove of redwoods, the Ventana Campground straddles the line between truly “roughing it” and “glamping.” If you’re the kind of rugged outdoor pioneer who’s looking to spend days hiking and backpacking to a remote campsite miles from civilization, Ventana isn’t for you. The campsites are fairly close together in some areas. Each spot comes with a picnic table and fire pit. The place even has its own small camp store and pretty swanky bathrooms and showers. Those nice facilities are courtesy of Facebook billionaire Sean Parker. In true, clueless Silicon Valley fashion, Parker rented the park out for his lavish wedding and set about illegally tearing up the site with bulldozers and building unauthorized structures. When all was said and done, the California Coastal Commission forced him to pay a $2.5 million fine. The money would be used to pay for costal access projects. That included the nice new bathrooms and showers at the Ventana Campground. 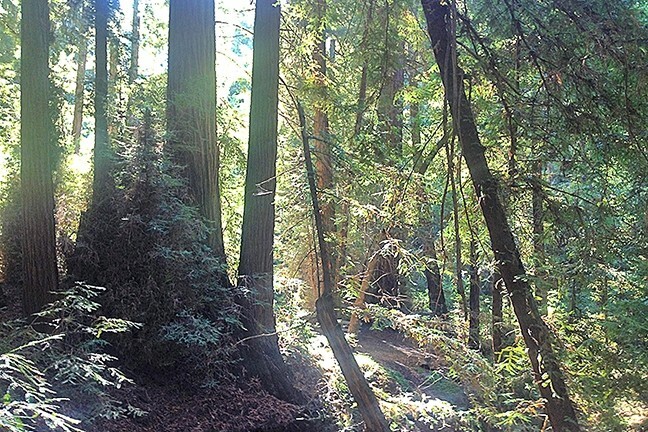 INTO THE WOODS : The Ventana Campground is the perfect spot for amateur campers who want to take in Big Sur's beauty. Despite all the civilized perks, the campground is still beautiful and awe-inspiring, at least for someone like me who’d never been to Big Sur before. My campsite was set in a clearing surrounded with massive trees and flanked by gargantuan redwood stumps covered in carpets of thick moss. After a summer of staring at the yellowed, drought-parched fields in SLO County, it took my eyes time to adjust to just how lush the surroundings were. In a stroke of luck, my small camping party, which consisted of myself, my girlfriend, and our tiny dog, chose to camp Thursday and Friday. Because the campground’s busiest days are the weekends, we were relatively alone and had few neighbors, allowing us to enjoy the maximum amount of solitude and relaxation that a fairly easy-to-access and popular campground like Ventana could offer. As Californians, it is both our right and duty to endlessly complain about where we live. It is expensive. There’s not enough water. The Dodgers never make it out of the playoffs, etc. But places like Big Sur remind us why we put up with all of that. This state is still vast and beautiful and down right cool. Staff Writer Chris McGuinness has an embarrassing amount of difficulty starting a campfire. He can be reached at cmcguinness@newtimesslo.com.